Just like the island, the new Hven series brings together the best from two worlds in the form of design, craftsmanship and values. The arm chair comes in a natural oak version, or a solid ash version, lacquered in blue or lightgrey. The furniture is entirely made of wood and tells an impressive story of a minimalistic design with few subtle details, characterized by slightly bend surfaces and rounded legs. This adds both weight and lightness to Hven in a well-balanced composition. 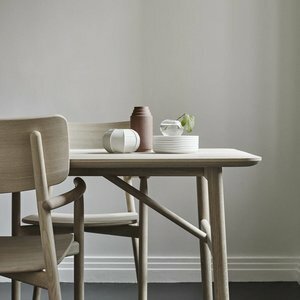 Anton Björsing is a trained joiner, with the inherent will and properties of wood as his key professional focus. After additional training at the design school in Stockholm, his craft-based understanding of the material and the more problem-solving aspects of the design profession came together in a fruitful combination. Two aspects of the design profession, which form the strength of Anton Björsing’s ambition and work today, as he either immerses himself in the potential of the material or in concept development – from draft to product to consumer – typically cutting to the bone in an effort to arrive at a simple, expressive product.